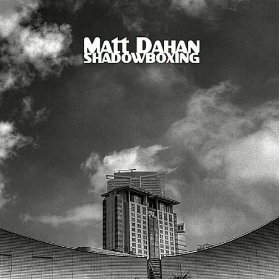 Matt Dahan’s solo album, Shadowboxing, mixes very distinctive ’80s-style synths with a powerpop — and sometimes quieter a folk rock — sound. This results in a lot of light, fun songs, but at points, they verge on cheesy and become way too sugary. Having trained at Berklee College Of Music, Dahan is certainly a capable musician with a solid voice, but the album feels like a draft of something, unfinished and needing edits. Some songs have a juvenile sound that’s way too sweet. The verses in “Can You Feel Love?” may convince you that you’re listening to a Backstreet Boys album. “Go” has a very strong ’80s style with a light swooping synth sound and verses that belong at a middle school dance in 1986. A throwback sound can be really captivating and fresh, but the way Dahan uses it here is a little stale. The better songs on the album have a more natural feeling. “Please, Icarus” is a light, happy song that may remind you of someone like Matt Nathanson, who has gone mainstream with this very marketable sound. “Flawless” is another effortless track on the album that sounds like it could have easily been a James Blunt song back in his heyday. The acoustic “Let It Begin” is the prettiest song on the album, and ironically, the last one. Lyrically it’s also the most apparent, with a simple stone metaphor that aids Dahan in begging his love to have him, any way she wants him. “Spinning” does a good job of blending a sprinkling synth with a rock sound that’s danceable and entertaining, pulling in more of the powerpop sound that Dahan seems comfortable with. “Fever Dream” stands out with a cool brooding feeling, and “1972” sounds straight out of a The Rocket Summer album. Dahan’s voice does well stretched out to notes at the ends of his range, creating a more strangled sound that compliments the powerpop style. Dahan seems to be on the verge of something that could be really solid, but this album isn’t there yet. However, a lot of the songs are still fun to listen to, and they certainly won’t offend your eardrums.